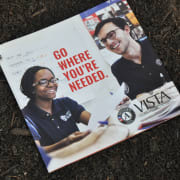 Keep Charlotte Beautiful (KCB), a Keep America Beautiful Affiliate and an Environmental Conservation Organization is partnering with Wintergarden to hire a Volunteer in Service to America(VISTA) to develop and sustain the 24-hour Ebenezer Food Pantry and the 'Garden in the Pines’ Community Garden. The objective is to empower people to learn how to provide fresh food for their family and become less dependent on food pantries in our community. The position is paid through a grant secured by KCB for a one-year period. We are looking for a person with the energy and drive necessary to be the catalyst for change to help eradicate hunger in our community.